The White Screen range allows complete Proofing Stations to be assembled from standard components, but constructed to meet your particular requirements. Although smaller Proofing Stations can be bench mounted, they are normally supplied floor standing with appropriate storage underneath. So you have a complete solution, providing both ideal viewing conditions, and high quality storage. Models start at A3 size, and an arrangement like Model 37.404 illustrated on the left would be typical. For this arrangement, larger units with viewing areas of 50 x 70 cm and 70 x 100 cm are available. This model has an Asymmetric Overhead Proof Light, with built in hour meter, viewing surface with variable inclination, and storage below in an open shelf, storage drawer, and two door cupboard. Colours are neutral silver grey in the viewing area, with complementary anthracite grey doors and drawer front. On the right is a larger unit, Model 30.204 with an optional side chest for extra storage, and transparency viewer on a swivel mount at the side. For this model, two sizes are available with 50 x 70 cm or 70 x 100 cm viewing areas. These units incorporate an Asymmetric Overhead Proof Light, with built in hour meter, viewing surface with variable inclination, and multiple drawers for storage in the base. Colours are silver grey and anthracite. These units are modular, so two or more can be grouped together, or as illustrated, more work surface and storage can be provided with an additional drawer chest. The Transparency Viewer is an optional extra. 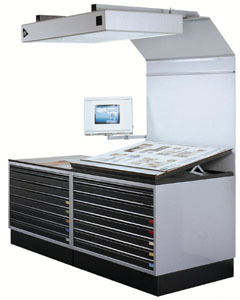 For graphic arts applications, these units are normally supplied with D50 tubes ( colour temperature of 5,000K), and produce an illumination level of approx. 1,500 Lux. When fitted with D50 tubes, the lighting conforms to ISO 3664:2000. For other applications, lights can be supplied with D65 tubes, ( colour temperature of 6,500K). The White Screen range is available in the UK exclusively from Cherlyn. Please click here for your copy of the full White Screen Catalogue.